No Easter basket is complete without one or two of these little guys nestled in that shiny, crinkly grass, but as you ravenously gnaw on a chocolate ear or a foot, have you ever wondered why we eat rabbits (the chocolate ones, not the real ones) during Easter? It can be traced back, like most other modern holiday traditions, to pagan Europe. Rabbits (or more specifically, hares) have been a spring symbol for generations. Since they’re assumed to be extremely, um, enthusiastic in their breeding, rabbits were long associated with fertility. As spring is the season for new birth, fertility, and growth, it made sense to link spring with rabbits. The Germans are credited with the creation of rabbit-shaped confections, having made long-eared pastries and cakes as early as the 1800s. Naturally, it didn’t take too long for this tradition to reach North America. Today, the chocolate bunny is the ubiquitous symbol of Easter. It is definitely the most popular Easter treat, and 76% of Americans say that they eat the ears first. There’s even an online quiz (not to be taken too seriously, of course!) which predicts your personality based on which part you bite down on first. 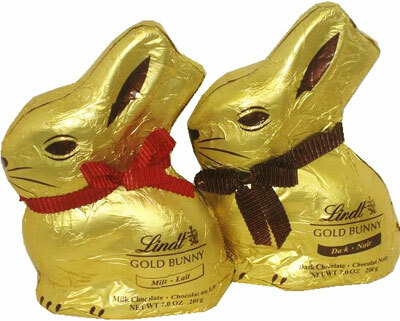 And last but not least, there is an ongoing campaign to make sure the only bunnies given as gifts during Easter are the chocolate kind, not the real kind. So the next time you bite into a chocolate rabbit, take a moment to ponder the rich history contained in that little brown face, and enjoy that brief period of time you spend together. i thinkkk they r so good!! !